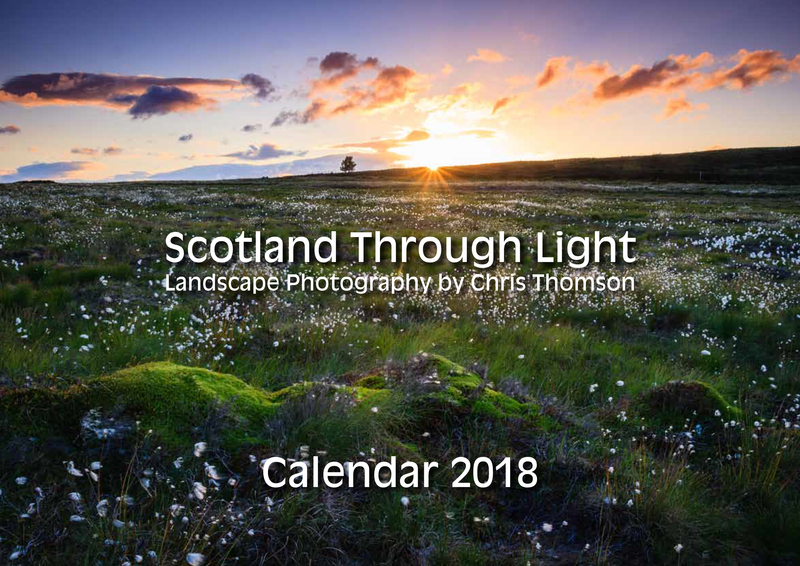 I’m pleased to announce the availability of the Scotland Through Light 2018 calendar. The format is the same as the last calendar – A4 spiral bound calendar which opens out to an A3 size. The cost of the calendar is £8 plus postage. I am also offering three calendars for £20 plus postage. If you live near me then I might be able to drop off the calendar or you can collect them from me. 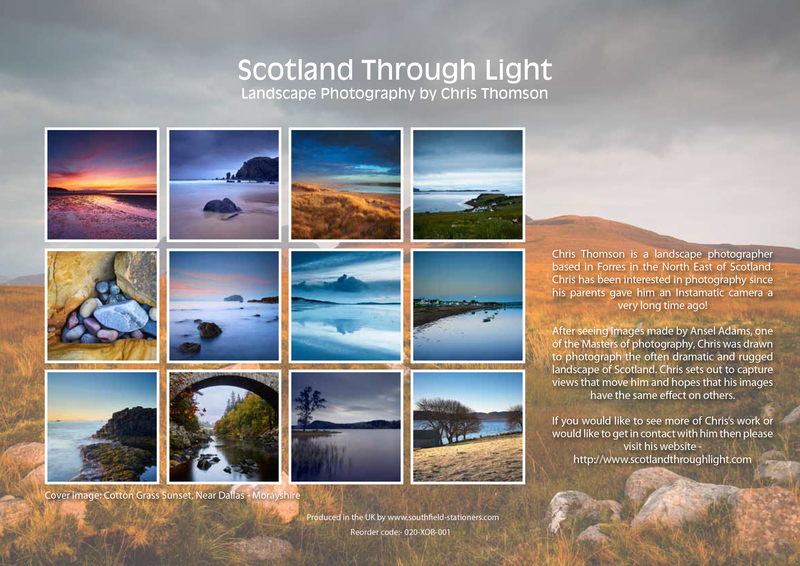 To purchase calendars from me then select “Scotland Through Light 2018 Calendar” from the store menu and then click on the image for either the Single Calendar or Special Offer (3 for £20), this will take you to my shop on Etsy.com. Alternatively if you’d rather not purchase through Etsy then get in touch with me using the Contact page and we can take it from there. In 2013, I had greetings cards and prints available for sale in a lovely wee shop called The Milk Parlour in Findhorn. Sadly, the Milk Parlour closed and since then, I haven’t had a retail outlet for my work. In August this year I was approached by a printing/stationery company to see if I would be interested in any of their products. They produce a wide range of items including cards and calendars. It has been about seven years since I last produced a calendar and I was naturally quite interested in the possibility of bringing back the Scotland Through Light calendar. So after very little persuasion from the printing company, I am pleased to announce the Scotland Through Light calendar 2016. 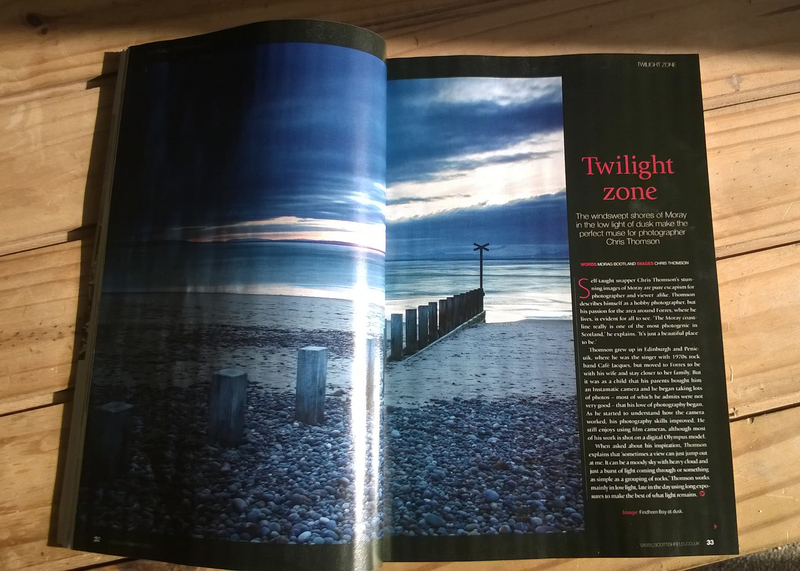 Following on from my post last weekend, the November issue of Scottish Field magazine is now out and I have a 9 page photo feature in it. The pictures look really quite good (I’m biased of course!). I was concerned that there would have been colour shifts or a darkening of the images, but this has not happened. This is my first post in a while, in fact looking at the control panel for my blog it would appear that it is a year since I last posted an entry on here. Its been a busy year for me so far with a lot of time taken up with moving in to a new house and there’s not really been much time for photography. Over the last few weeks I’ve managed to get out a bit more for photos which has been good.